The iPhone Dev Team told us a couple days ago ultrasn0w will be released on Sunday to unlock your iPhone on 4.2.1. Dev Team member MuscleNerd tweeted tonight that ultrasn0w is working fully on 4.2.1. This is great news for those that require an iPhone unlock. 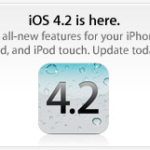 As always, do not update to iOS 4.2.1 via iTunes if you want to keep your existing unlock.